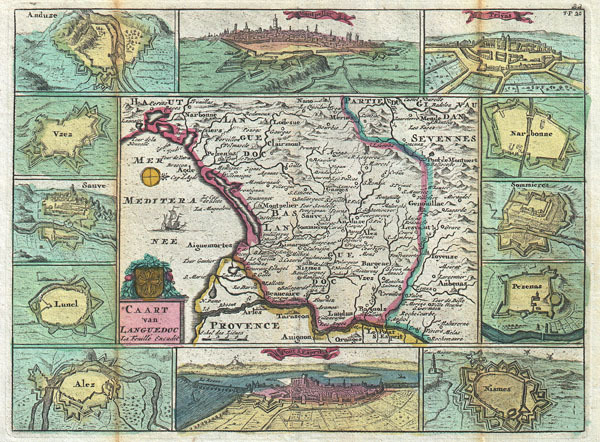 A stunning map of Languedoc, France first drawn by Daniel de la Feuille in 1706. This province in southeastern France roughly corresponds with the modern day departments of Gévaudan, Velay, and Vivarais. Surrounded by twelve views of important villages and fortresses in this region. From top right in a clockwise fashion these include Privas, Narbonne, Sommieres, Pezenns, Mismes, Pont S. Esprit, Alez, Lunel, Sauve, Vzez, Ansuze and Montpelier. This is Paul de la Feuille's 1747 reissue of his father Daniel's 1706 map. Prepared for issue as plate no. 27 in J. Ratelband's 1747 Geographisch-Toneel.